We’d love your help. Let us know what’s wrong with this preview of The Performance Cortex by Zach Schonbrun. On a quest to discover what ac "A must-read for the cerebral sports fan...like Moneyball except nerdier. Much nerdier." To ask other readers questions about The Performance Cortex, please sign up. Not groundbreaking, but interesting and easy to read. Research on the subject and our understanding of athletic performance are still very much in their infancy, but the hope is that books like this will spark future interest. The ending feels abrupt and unrelated to the heading of the last chapter (perhaps more appropriate as an epilogue). Finally, it would have been nice to have a proper conclusion (somewhat lacking as is), bringing the whole book together and hinting at (or at least asking) w Not groundbreaking, but interesting and easy to read. Research on the subject and our understanding of athletic performance are still very much in their infancy, but the hope is that books like this will spark future interest. The ending feels abrupt and unrelated to the heading of the last chapter (perhaps more appropriate as an epilogue). Finally, it would have been nice to have a proper conclusion (somewhat lacking as is), bringing the whole book together and hinting at (or at least asking) where we might go from here. This book doesn’t deliver what it promises. The book starts off well explaining some basic concepts of neuroscience. It describes some aspects of brain imaging and EEG relative to performance and motor tasks. But then the book seems to get lost to tell me more about neuroscience that seems Irrelevant. It Never comes back to its main premise to explain the performance cortex. The subtitle is pretty misleading! The book's mostly just a summary of neuroscience research that sometimes espouses on how that might impact sports, someday. Book seems just a teensy bit too early to really say anything. There were also a lot of really weird phrasing tics? Idk it was prolly a 2 but I'm just being mean. This is a long tedious book on neurology with only brief links to sports. Long historical chapters in the field and very few applications to performance and sports . A total waste of money. What is it that truly defines athletic genius? While there’s no doubt that physique and physicality play massive roles in what makes a successful athlete, there’s more to it than that. True sporting greatness springs from not just one’s body, but also that body’s connection with the brain. In his new book “The Performance Cortex: How Neuroscience is Redefining Athletic Genius,” Zach Schonbrun attempts to explore that connection; it’s a deep dive into the neuroscience behind movement that attempts to develop an understanding of the body-brain relationship and determining how the relationship impacts those performing at an elite athletic level. Professional sports franchises are constantly on the hunt for anything that will give them an edge. However, those same franchises often struggle with any idea that in any way upsets the established paradigm. Basically, they want to have their cake and eat it too – they want to make improvements without actually changing their philosophy in any significant way. The unofficial “stars” of this story are probably Jason Sherwin and Jordan Muraskin, founders of a startup called deCervo. Their plan? To gather neurological data that will provide insight into a heretofore unparsed question – what happens in the brain to allow a big-league hitter to actually hit a ball? It sounds simple – and for many years, the MLB attitude was basically “See the ball, hit the ball” and that was that – but it turns out that there’s a lot happening on a neurological level during that process. And by measuring and quantifying that activity, the thought is that such information can potentially be used in a variety of ways – from improving the performance of current players to informing which future prospects are pursued going forward. Alongside Sherwin and Muraskin’s journey to evolve their methods and develop relationships with MLB teams that are both intrigued by and skeptical of the benefits of this science, Schonbrun explores further. He offers up a bit of history behind the idea of the body-brain connection, a concept that has been subject to a surprising amount of controversy over the years … at least, when people have bothered with what many long considered an unexciting field of study. Schonbrun also spends time with a number of prominent current figures in the field, which allows for a depth of intellectual engagement that you don’t always find in this kind of ostensibly pop-science work. He’s unafraid to challenge you a little; it gets pretty – forgive the phrase – inside baseball at times. It’s a bit rigorous, but it’s really satisfying to put in a little work and gain actual insight as opposed to keeping things on the surface level. And of course, there’s plenty of overlap with the athletic world. We get to see the direct connection between research and players a la operations like deCervo. But we also get to do some indirect exploration in terms of considering what role the brain plays in this kind of brilliance. How does Tom Brady do what he does in the way that he does it? Stephen Curry doesn’t have the elite athletic gifts of some of his peers, so how does he outperform them? Why did Michael Jordan – a consensus all-time great athlete – struggle so mightily when he moved from the basketball court to the baseball field? The science at play in “The Performance Cortex” doesn’t fully answer these questions, but it offers some thoughtful hypotheses and loads of useful context. There’s a freewheeling style to Schonbrun’s work here that seems as though it should be a less-than-ideal fit, and yet – it works. The writer does a remarkable job flipping back and forth between jargon-laden academic conversation and the laconic flow of the locker room. The blend of nerdese and jock talk is reminiscent of a happy ending in a college comedy – two great tastes that surprisingly taste great together. Hitting a baseball has often been called the hardest thing in sports. When you're talking about professional baseball, the batter has milliseconds to take in the information about the placement and type of pitch that's coming at him, make a judgment on if the pitch is hittable, assess the probabilities of the success of the hit, and make the movements necessary to connect with the ball. It's an unbelievably complex process, and yet you can see hundreds of examples in any major league baseball ga Hitting a baseball has often been called the hardest thing in sports. When you're talking about professional baseball, the batter has milliseconds to take in the information about the placement and type of pitch that's coming at him, make a judgment on if the pitch is hittable, assess the probabilities of the success of the hit, and make the movements necessary to connect with the ball. It's an unbelievably complex process, and yet you can see hundreds of examples in any major league baseball game any night of the summer. Why does all this matter? For several reasons, according to sports writer Zach Schonbrun. First of all, it matters to anyone in baseball (including us fans sitting in the stands or in bars or in homes cheering on our favorite players) because it opens up opportunities for our batters to improve and for the next generation of players with the brains of master ball strikers to be scouted to our favorite teams. But beyond the baseball diamond, these principles can be expanded to help anyone improve any set of skills they want. Using the ideas in Schonbrun's book The Performance Cortex, musicians can learn to play more proficiently, bakers can decorate their cakes more efficiently, and knitters can wield their needles with more speed and accuracy than before. This book is a deep dive--way way deep--into the neuroscience of performance. Schonbrun takes us on a journey through all different areas of brain science that could apply to making a good ball player better. He takes us through probability and prediction, expertise and experience, movement and motion, schemas and skills. The research is impeccable and extensive and offers science-based answers for all the questions you could ever possibly think of. You know it's going to be a compelling tool when sports and business shark Mark Cuban has been seen toting it around, and indeed this book is a powerhouse of information. This is not a quick read. In fact, I think some of my grad school textbooks were easier to digest, but each chapter brings a new and interesting level of understanding as well as host of fascinating brain scientists from around the world that keep the stories personable and personal. Where Moneyball looked at the new data-driven model of sports management, The Performance Cortex takes us to the next level, the brain science based model of sports management. In short, this is the future of your favorite baseball team. But most importantly, if Zach Schonbrun and his neuroscientist friends can bring my beloved Kansas City Royals back to the level of that 2015 World Series win, then this book is the best sports book ever! Many years ago, I recall reading an article about how Tiger Woods learned to golf so well by the scientific methods taught to him by his father. Curious, I never pursued that interesting fact, but it came to mind again with this book about the brain and athletic performance. The brain can be trained for athletic performance up to a certain age, exemplified by the author’s reference to Michael Jordan who had an interest in baseball but couldn’t grow in the required skills and yet had what was nee Many years ago, I recall reading an article about how Tiger Woods learned to golf so well by the scientific methods taught to him by his father. Curious, I never pursued that interesting fact, but it came to mind again with this book about the brain and athletic performance. The brain can be trained for athletic performance up to a certain age, exemplified by the author’s reference to Michael Jordan who had an interest in baseball but couldn’t grow in the required skills and yet had what was needed for baseball. Dagmar Sternad has an Action Lab at Northeastern University. Here she experimented with the game skittles, demonstrating how timing from the brain and physiology conspires to make us winners or losers and how movement or kinetic patterns and features could be retained for up to eight years. There is also an interesting discussion of skills that are learned and involve brain activity but can not develop further because of “habit” that negates any further learning curve from progressing. This involves “action controllers, “automatization” or even “muscle memory” as an action or sequence of actions that get formed, reorganized and consolidated in our long-term memory. And so it goes. These are a few of the examples and explanations that tell the story of athletic and normal action in an understandable presentation, such as the reflex arc, the feed-forward loop of sensory-to-motor connections that trigger everyday actions or the position of neural swing decisions in baseball, tennis and volleyball serves. The authors even describe how “virtual arms” learn to operate or are taught by science to understand the training behind using these prostheses. Anyone interested in physical activity, sports, coaching etc. will find this book fascinating and interesting for practice or just understanding the theories and applications that apply when playing or watching sports. Highly recommended and engaging science in a credible, readable book. Nicely done, Zach Schonbrun! 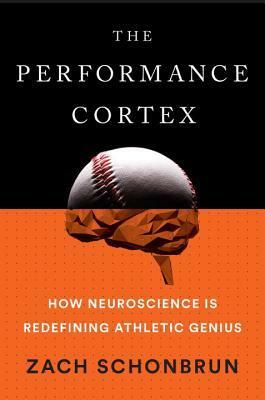 My appreciation of athletic genius has tripled, quadrupled, or more after reading The Performance Cortex: How Neuroscience Is Redefining Athletic Genius. Much more than hand-eye coordination or muscle strength or even a passion for the game, genius takes on many other elements of the human body/brain gifts given. The brain is an amazing part of the athletic genius in greats like Tom Brady, Michael Jordan, or Lionel Messi. The book focuses in part on neuroscientists, Jordan Muraskin and Jason She My appreciation of athletic genius has tripled, quadrupled, or more after reading The Performance Cortex: How Neuroscience Is Redefining Athletic Genius. Much more than hand-eye coordination or muscle strength or even a passion for the game, genius takes on many other elements of the human body/brain gifts given. The brain is an amazing part of the athletic genius in greats like Tom Brady, Michael Jordan, or Lionel Messi. The book focuses in part on neuroscientists, Jordan Muraskin and Jason Sherwin, who study the science behind the game of baseball. Their company deCervo is assisting, through neuroscience, baseball athletes in their quest to achieve their greatest potential. A fascinating read, although, admittedly not for everyone. Sports fans, undoubtedly will find it amazing and just may change their own views of what makes us genius. It appears that there are applications in sports that measure performance, decision-making, and physical responses in milliseconds. There also appears to be a growing body on knowledge and scientific research that can potentially shave off milliseconds in performance and enhance the overall outcome. I enjoyed the book and the research that went into it. Minor criticism was that a portion of the last third of the book read like a reading list for a neuroscience class. But the book ended on a high It appears that there are applications in sports that measure performance, decision-making, and physical responses in milliseconds. There also appears to be a growing body on knowledge and scientific research that can potentially shave off milliseconds in performance and enhance the overall outcome. Some very interesting bits and some very technical bits. It was a nice change to read a brain book that was about motion instead of cognition, and one that filled you with amazement at what we're actually able to do, and how miraculous it all is. Despite the title, it's not just about "redefining athletic genius," though there is a fair amount about hitting baseballs and a baseball startup trying to gauge pitch recognition time and whether or not to swing. A good read for those considering going i Some very interesting bits and some very technical bits. It was a nice change to read a brain book that was about motion instead of cognition, and one that filled you with amazement at what we're actually able to do, and how miraculous it all is. Great work by my friend Zach. He gets a little heavy into the science, so if that’s not your thing you may not love it. But he has still come up with a fascinating book on a topic that is only likely to become more important in sports. Teams are looking to train the brain along with the muscles. You can bet they also want to evaluate brains along with every physical skill. A really good read that takes you on an interesting journey about the brain from the perspective of human performance and movement. The people stories, progress of the science, and the applications to human performance were interwoven very well throughout. This book discusses the many applications of neuroscience in sports. I also appreciated the skepticism discussed in the book that analyzes the construct validity and external validity of these methods.